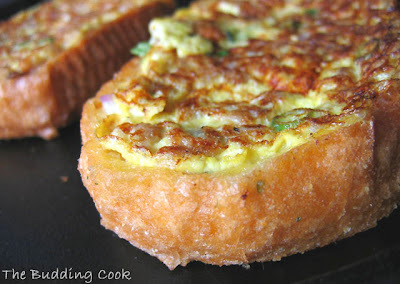 I was looking for something simple to make for Sia’s Street Food edition of the Monthly Blog Patrol, and was browsing through some of my favorite blogs when I came across a recipe for Roti John on Nupur's blog. Roti John, I found out, is a popular and much-loved dish sold by hawkers on the streets of Singapore. It is basically a toasted French loaf spread with pan grilled eggs and minced meat, and served with a chilli- ketchup sauce. It sounded a lot like my version of French toast, minus the minced meat. I followed Nupur's recipe. She uses soy granules as a substitute for the minced meat that the original version calls for. In a bowl, beat the eggs along with milk and add the soy granules, chillies, onions and salt. Mix well. Heat the oil in a pan. Slather a generous amount of the egg mixture onto one side of the bread. Pan fry each side till brown and slightly crisp. Repeat for every slice. Serve hot. We had this with some Maggi hot and sweet sauce. I had some of the egg mixture left over at the end which I used to make something else. I'll save that for another post. Really interesting. It reminds me of a street snack in China involving fried egg on a more pancake like structure (opposed to the bread) and served with a few sauces. Anyhow, this looks quite good! Yum ! Love the idea of making it with soy granules. that looks so yummy..will try minus the eggs..with paneer!...wow..your does give that real tempting street food look! I make the same version as yours (without the meat) since I sweet breakfasts are not my thing....this version sounds good too - and that pic is mouth watering! It is the first time i hear about this roti john, but it looks so delicious. Oh my- your roti john with the thick texas toast looks soooo good! You are right, it is so much like our Indian savory "French" toast but the addition of soy granules makes it even heartier. doesn't nupur dig up the most amazing recipes from the recesses of the web? yours looks yummy. Thanks for sending it to the event TBC. I would love to taste it, but not make it, because I don't cook eggs. So will knock on your door! That is indeed a nice way of using soya granules!! Yum! eggs on french baguette looks great...we don't cook eggs at home, so can't try it. Rajitha- so when do we get to see a post?? Rashmi- oooh, you're from Singapore! Does mine look anything like the original version? Hope your mom reached safely. Haven't been blogging or blog hopping for the past few months and seems that I have missed lot of your posts. Roti john looks so yum yum. Soy granules, I must try...Nice post. hey there! firstly loving this recipe!!! will try it as well, secondly, I was looking for comments link and saw 26 burps! I laughed so loudly my baby almost woke up!!! about the erissery - we love erissery and there are a few kinds to make as well - so it does end up being cooked other than onasadya! Hi..just saw your query on my comment..honestly speaking, yours looks as good as some & better than lots that I have tried here.